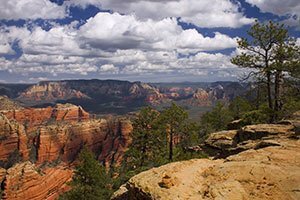 Embark on an adventure that encompasses both natural beauty and historical significance. 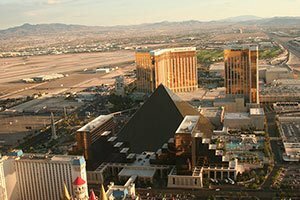 Start with a helicopter flight to the Grand Canyon West Rim, with sights of the Mojave Desert, Hoover Dam, and Lake Mead along the way. 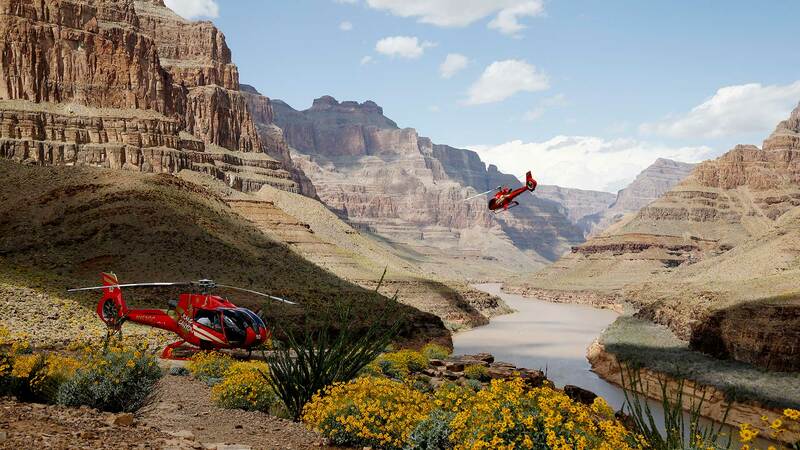 Upon arriving at Grand Canyon West, your helicopter will descend 4,000 feet to the canyon floor and land near the Colorado River where a champagne picnic awaits. After lunch, you'll travel to Eldorado Canyon for a fully-guided tour of the Techatticup Mine. While you venture through the mine, you'll learn about the miners who traveled to this area during Nevada's biggest mining boom. 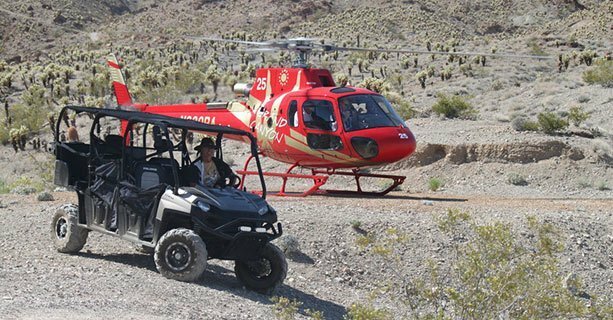 After learning about the site's historical significance, you'll tour the desert landscape on a Baja Jeep or ATV. 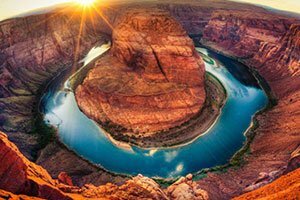 Return to Las Vegas after an adventure-filled day in the beautiful and historic Grand Canyon and Eldorado Canyon. 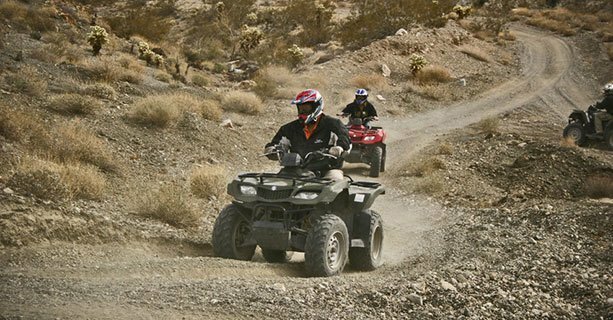 ATV – Experience the exhilaration of riding an ATV through the desert landscape of Eldorado Canyon and get up-close-and-personal with its rugged natural beauty. Boots or sturdy shoes are required (no open-toed shoes, sandals, high heels or flip-flops are permitted). ATV riders must be a minimum of 16 years of age with a valid driver’s license. One person is permitted per ATV. 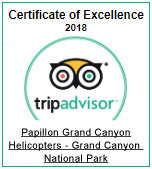 Baja Jeep – Board your customized Baja Jeep driven by a trained guide and buckle in for an off-road excursion through Eldorado Canyon’s scenic overlooks and historic mine shafts. This option is best for visitors seeking adventure with minimal physical demands. Riders in the Baja Jeep must be 6 years old or older. Check-in at our state of the art terminal in Boulder City. Please make sure you bring government-issued photo identification. 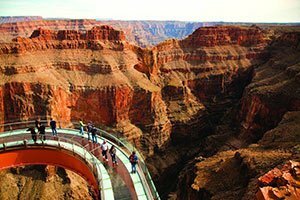 Witness spectacular views of the volcanic Black Mountains, Hoover Dam, Lake Mead, and Grapevine Mesa before crossing the Grand Wash Cliffs into the Grand Canyon. Enjoy a champagne picnic and time to explore the surrounding area for approximately 30 minutes. 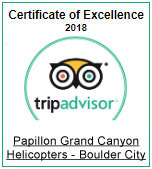 Upon landing in Eldorado Canyon, meet your Awesome Adventures tour guide and begin an exciting guided tour through the historical Techatticup Gold Mine. Explore an authentic ghost town just outside the mine and learn true stories of Indian renegades. Choice of either an ATV or Jeep ride through Eldorado Canyon. 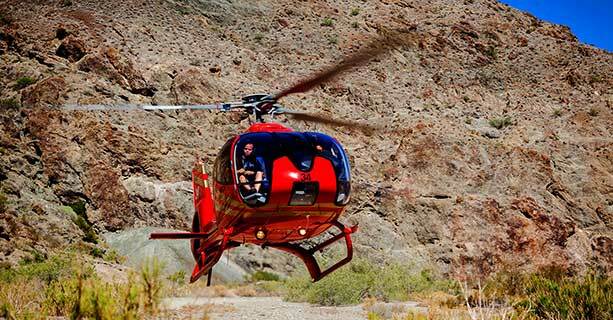 Each ground excursion is approximately 2 hours and should be confirmed at time of booking. Anyone under 18 years must have parent/guardian sign paperwork in the presence of Awesome Adventures employee. Information pertaining to each ground excursion is provided below. 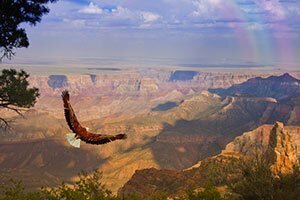 After ground excursion, enjoy a picnic lunch and soak in the scenery at Eldorado Canyon. Vegetarian meals are available but must be requested at time of booking. Meal includes: Turkey sandwich, chips, cookie, bottled water.